"They were on the highest parts of the house. Above the kitchen cabinet. On the back of the sink. It was pitiful." Alex Layton spent the holiday weekend making house calls in Hurricane Matthew's flooded wake. 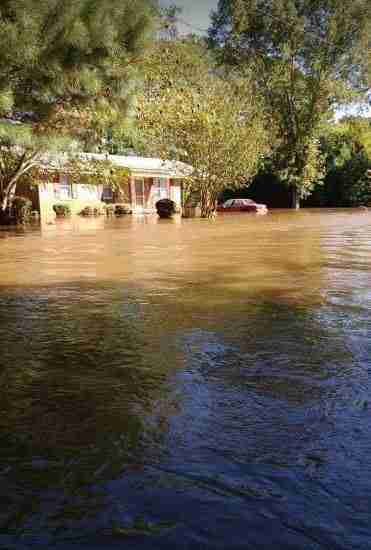 A boat would take her up flooded driveways right up to someone's front door. If she had the key - some owners had given her a set earlier - she could unlock it. But with water surging up past the knob and around Layton's waist, the door still needed to be shoved open by several people from her rescue team. And inside, they would find that they were looking for: pets cowering on the highest surfaces they could cling to. Like the desperate family of cats she found at one house. "That's where it hit me the most," Layton tells The Dodo. "They were on the highest parts of the house. Above the kitchen cabinet. On the back of the sink. It was pitiful." 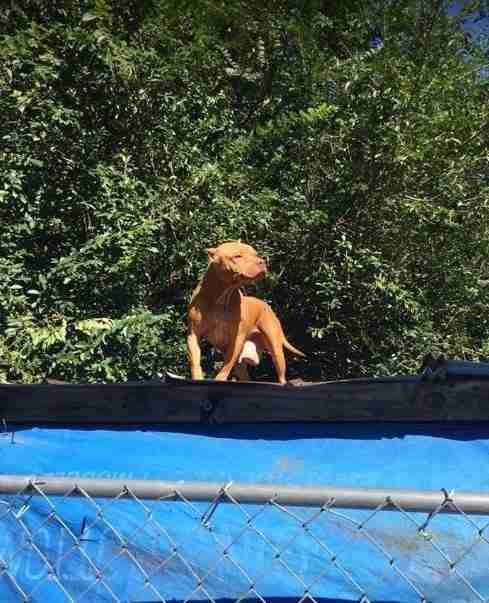 Layton was among an army of volunteers working alongside firefighters and rescue crews in Pinetops, North Carolina, to save as many lives as they could - including those of pets who had been hastily left behind. 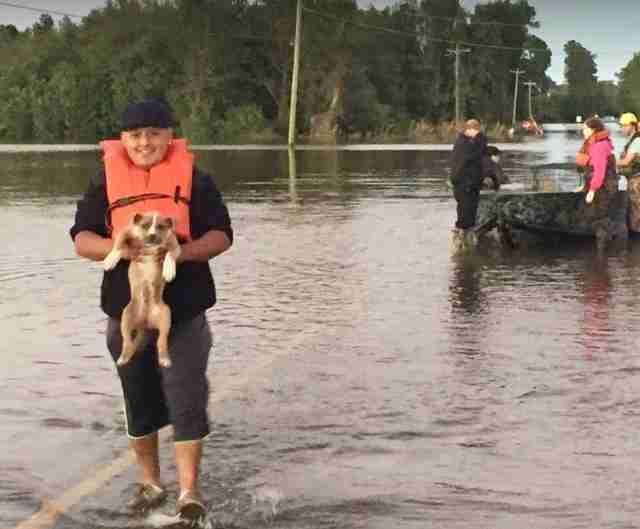 In Pinetops, few expected the floodwaters to rise so high in the wake of Hurricane Matthew. 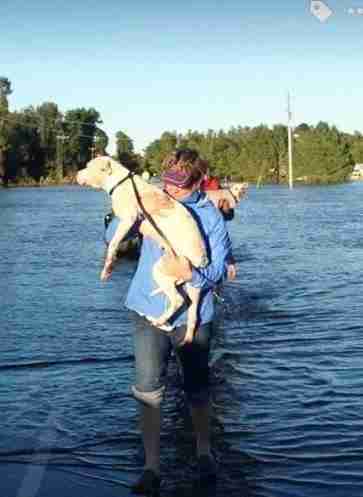 While hundreds of people were evacuated, many could only take one pet with them. "We were not expecting any of this," Layton says. "We were expecting to be hit lightly and maybe three or four inches (of water)." Layton, who rescues and fosters dogs, and volunteers at the Maggie Society, was one of the people who got the call early Sunday morning. 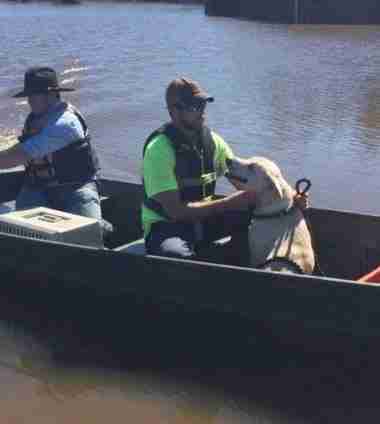 While she joined a crew on several boats making runs to swamped houses and yards, more volunteers, like Kim Edmondson and Celena Edwards of the Wilson County Humane Society, stood on shore with crates. The dogs and cats - many of them fished from the water - were shivering and cold, and had to be moved indoors immediately. Every time Layton sailed out, her list seemed to get longer and longer and frantic pet owners gave her an address to check in on their pets. In some cases where Layton wasn't given keys from worried homeowners, she would look for an open wondow to crawl through. In all, Layton's rescue crew managed to save 27 dogs, four cats, a horse ... and one somewhat unexpected victim. "A family member had told me they had left their chinchilla," Layton says. "So we called the boat that was out there and they went and got their chinchilla." Her team was only one of several that made daring forays into flooded neighborhoods to rescue people and pets. In one dramatic scene, the U.S. Coast Guard saved a dog swimming desperately in muddy waters. All of the animals are now safe. 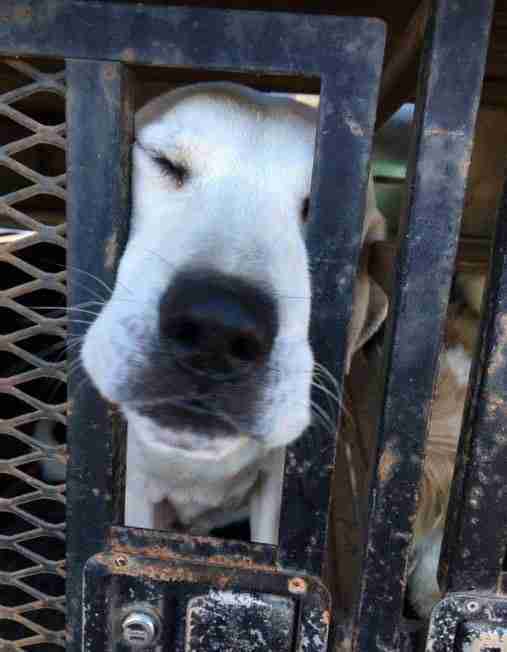 People in areas that weren't affected by the storm offered kennels for some of the animals. Layton is keeping some at her house. The humane society is boarding a few. 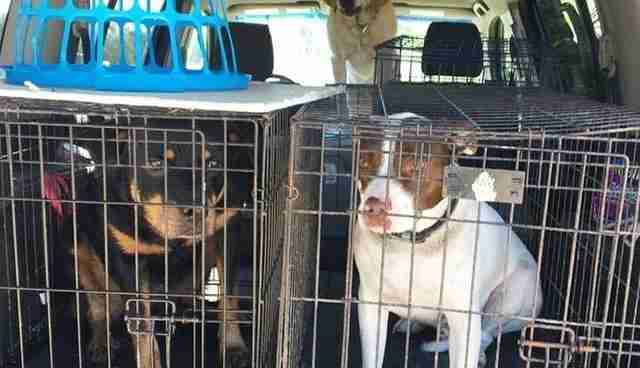 And the rest have already been reunited with their owners. But Pinetops will have a lot of rebuilding to do. Many of the kennels and homes in the area are underwater. 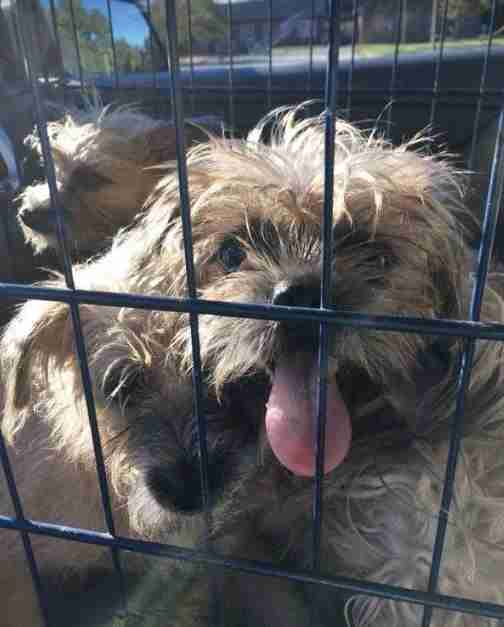 In addition, many of the dogs and cats recovered will need to be spayed and neutered. Layton has set up a fund to help the rebuild in the aftermath of the flood, as well as to get the veterinary care they need. You can make a donation to southerland@myglnc.com through PayPal.